This Thai Peanut Sauce recipe features more peanut flavour, perfect for adding a tasty Thai touch to meals at home. This certified gluten free formula is an excellent dipping sauce, pairing especially well with spring rolls. 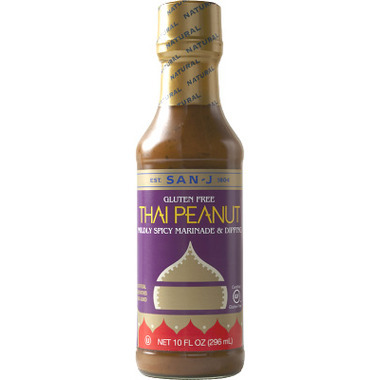 Marinating with Thai Peanut is also a quick and easy way to add a touch of the exotic to your next meal. For a tasty satay, marinate chicken in Thai Peanut, thread onto presoaked skewers and grill or broil until done. Ingredients: Tamari Soy Sauce (Water, Soybeans, Salt, Alcohol), Peanuts, Organic Sugar, Water, Apple Cider Vinegar, Sake (Water, Rice, Salt), Honey, Rice Vinegar, Garlic Powder, Salt, Spices, Lemon Concentrate, Canola Oil, Cilantro, Xanthan Gum. I like it in stir fry and to bbq but not so much for dipping - too intense. My family loves this sauce!! It's just nicely spicy and works very well on chicken and veggies. Great as a marinade! Way too spicy for a dipping sauce. Not enough peanut flavour. Yum. A bit spicy and very yummy. Sorry but this sauce tastes terrible. I threw it right in the garbage. This is a very tasty product, with a bit of a bite. I buy it all the time and use it in stir fries, and for dipping. This would be great in stirfries. It is much less peanutty than I thought it would be, but it has a good hot, spicy taste. I would definitely buy it again. Very good. Perfect for stirfry or for use as s dipping sauce. I did add a bit of hoisin sauce and some sriracha spicy chili sauce to give it a bit of extra spice. Not my favourite San-J product. Was very runny. This is a great sauce! I use it to make Thai chicken burgers and the whole family loves the sauce. We like it also since it is gluten free! Love it! My first time buying it but not my last!! I made the most delicious gluten free rice noodle peanut sauce chicken stir fry with this sauce, it was so good that my husband ate it too, and he is normally picky, and he ate the leftovers too - he normally hates leftovers, yum!